Countless businesses are drowning in information. By phone, mail, fax, and e-mail, it washes over them every day—lab results, financial documents, dictation files, memos, and medical histories. Within the healthcare arena, paper document management has become a complex, costly, and time-consuming endeavor. Enter EHRs. These high-tech information management systems are supposed to help streamline how medical professionals do business. The problem? Patients and healthcare personnel both admit that the technology is altering face-to-face communications. Increasingly, competitive advantage within the healthcare market is being driven by innovative records management technology. Traditional paper-based models are giving way to electronic solutions, making documents and their content available at the click of a button. Nevertheless, only 20% of medical practices use EHRs, according to Barry Greene, CEO of medical technology integrator LibertasMD, who says cost is a key reason for the low adoption rate. “Until recently, quality EHRs were just too expensive for the average practice,” he says. 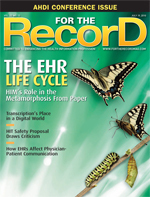 In a recent study of 60 in-depth interviews from 26 physician practices with commercial ambulatory care EMRs in place for more than two years, the Center for Studying Health System Change found that while EHRs allow doctors to spend more time with patients, they also could reduce real-time communication. To address these concerns, EHR vendors are attempting to make the technology more intuitive. O’Malley and her coauthors at the Center for Studying Health System Change recommend communication skills training for EHR newcomers in order to take full advantage of the technology’s options and to improve such nuances as making eye contact with patients. Also, physicians need to learn how they can engage patients at appropriate times by showing them parts of the EHR screen for educational purposes and to validate information.